One of my favorite things about fall is the pumpkin drinks. 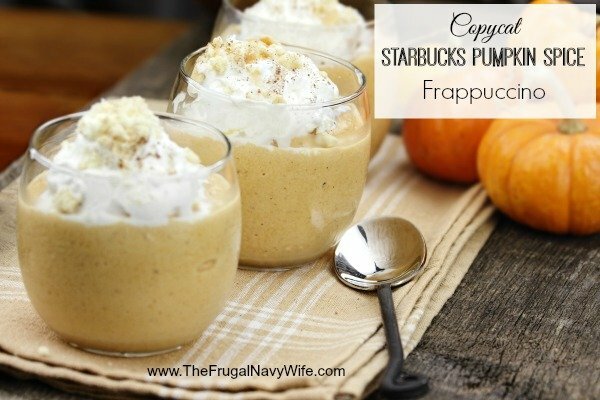 I found out about the Starbucks Pumpkin Spice Frappuccino last year and this year I am on a mission to make it and save some money (and get hubby addicted as well!) Here is the recipe I am using! Brew the coffee and refrigerate. Coffee MUST be very cold. In a bowl, whisk the milk, pumpkin, maple syrup,pumpkin pie spice together until combined. Pour into ice cube tray and allow to freeze. Once your coffee is cold & pumpkin ice cubes are frozen, add everything to your blender and blend on high until smooth and icy. Add more milk if your blender isn't blending it well. Taste test and adjust as needed. Top with whipped cream. Serve immediately.